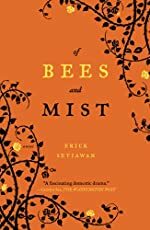 Of Bees and Mist is an engrossing fable that chronicles three generations of women under one family tree and places them in a mythical town where spirits and spells, witchcraft and demons, and prophets and clairvoyance are an everyday reality. Few in town agreed on when the battle began. The matchmaker believed it started the morning after the wedding, when Eva took all of Meridia’s gold and left her with thirteen meters of silk. The fortune-teller, backed by his crystal globe, swore that Eva’s eyes did not turn pitiless until Meridia drenched them in goose blood three months later. The midwife championed another theory: The feud started the day Meridia held her newborn son with such pride that Eva felt the need to humble her. But no matter how loudly the townspeople debated, the answer remained a mystery — and the two women themselves were to blame. Meridia said little, and Eva offered conflicting explanations, which confirmed the town’s suspicion that neither one of them could actually remember. Lovely! Want more? You can read the first chapter here (but wait! Read this interview first – it’s really good!). MB: You’ve mentioned in previous interviews that OF BEES AND MIST grew out of your childhood recollections of family stories and cultural fables. What was the spark that made you realize these various memories were a novel in the making? Was there a defining moment when you thought to yourself, “Wow, I’ve got something here”? Or was it a more gradual process? ES: Growing up in Indonesia, I always thought my family had enough drama to fill up several books (and that’s just my dad’s side of the family), so I knew I had the story. But whether or not I thought I could turn it into sentences and paragraphs, let alone a book, was a different matter. I wasn’t a born writer. When I was five, I wanted to be an invincible swordsman, not a writer. When I was twenty-five, I still wanted to be an unbeatable swordsman, not a writer. So I had this story to tell, but more often than not, I didn’t have the words to commit it to paper. A lot of the writing process for OF BEES AND MIST was just that—searching and begging the universe for the right words and convincing myself from day to day that I could do it. That was the part that was gradual, painstaking even. The good thing about it is while I agonized over how best to tell the story, the story itself grew and took on a life of its own, sprouting up channels and avenues that weren’t there before. I suppose there’s something to be said for allowing something to develop in its own time, instead of rushing it to the finish. MB: The novel is set in a mythical town richly infused with a sense of the magical. Was any research involved in creating this setting? Did you create maps, boundaries or sketches? ES: I did draw a rough map for the various locations in the book, just to remind myself where the characters lived and how their geographic location related to their social status. I started with a map of San Francisco, the city I love and where I currently live, and I remember putting Monarch Street in an affluent part of the city, and Orchard Road, just as the name implies, in a humbler neighborhood. As Daniel and Meridia improve their lot in the book, I move them closer and closer to the good part of town, so to speak. I found this method incredibly helpful in keeping things sorted out, at least in my own head. I read everything I could get my hands on when I was writing the book, from literary fiction to mystery and fantasy and also folk stories and fairy tales. I also used a lot of things I encountered during my childhood in Indonesia to create the magical elements in the book—the superstitions, the belief systems, the supernatural phenomena. This is not to say that I didn’t make a lot of stuff up, and it was an absolute delight to mix the real with the imagined. MB: You majored in psychology and computer science. Did you find yourself drawing on your experiences and education in either field as you wrote OF BEES AND MIST? ES: The two fields of study contributed to the writing in different ways. Psychology helped me understand the characters better. Eva, for example, is a textbook psychological case study: she’s borderline, paranoid, self-deluded, and very destructive, and I don’t think I would have understood her as much if I hadn’t studied her type of disorder in school. Computer science, on the other hand, while fairly useless when it came to writing the book, gave me the discipline to keep going. In software development, until you iron out every last bug in the program, there will always be problems, and I think with a book it’s a similar process. You may leave room for ambiguity, but until you fix every loophole and every gap in the story, it is not yet a full-fledged work. At least not to me. MB: And now for one of my favorite questions: outline? no outline? a little bit of both? Tell us about your planning and preparation process, what you do (if anything!) before you actually sit down and start to write. ES: I prefer manic, random scribbling on napkins and bits of paper to rigorous outlining. I always start with a rough outline in my head—I know approximately what’s going to happen and how I’m going to get there—but I never spell this out on paper. I think if you do that too much it can kill something valuable in the process, and you’ll lose that spontaneity. So I like to just let it flow, see where it goes. I know I will take a wrong turn many, many times, but I might discover something wonderful while making that mistake. MB: I think one of the most delicious things about writing is that, whether one outlines thoroughly or just writes by the seat of the pants, there seem to always be surprises along the way, whether it’s a subplot that suddenly shows up, or a character who comes to life in a way you never expected or a symbol that takes on a much deeper meaning. What were some of the surprises along the way for you in the writing of OF BEES AND MIST. ES: Malin is one character that most surprised me in the book. Her arc, when I planned it in the beginning, was rather modest. But she surprised me by being a much stronger and more complex character. She showed me that she was a lot more than the thin sketch I had for her, and she made me see that as a writer, I was far from being God or a dictator to my characters. If you listen to them, they will tell you what you are doing wrong. I love her journey from a spoiled little girl to the woman she becomes at the end of the book. The other element that took me by surprise was the magic in the book. I didn’t plan it that way—the first fifty or so pages of the first draft of the book had none of the magic—but it kept rearing its head onto the pages. At one point, it became undeniably obvious to me that the magic was inseparable from the book, and I couldn’t place these characters in any other setting. Without the magic, the book would not have been complete. MB: How long did it take you to finish writing OF BEES AND MIST? How many rewrites? Are you an edit-as-you-go writer, or a get-it-all-down-first writer? Or somewhere in between? It took me five years to write OF BEES AND MIST, five or six rewrites. As to what kind of writer, I’m somewhere in between. I’m a perfectionist in a sense that I can’t go to bed until I get that one sentence perfect, but I also know that until I get to the end, the manuscript will be littered with mistakes and plot holes and impossible character developments, so I’ve learned to let them be until the next rewrite. I think it’s a good thing. Otherwise, I’m going to keep rewriting and never getting to the end. MB: What’s a typical writing day like for you? I try to write a page a day, which doesn’t seem much, but it’s a lot for me. I’m that slow. On a good day, it’s only afternoon and I already have that page written—I’m done. On a bad day, it’s midnight and I still haven’t finished that page. As you can imagine, writing is both a joy and a pain for me. MB: Writing rituals and superstitions: most writers have them. Could you tell us something about yours? ES: Thankfully, I don’t have any rituals or superstitions. I can write anytime, anywhere, without having to chant or pray or burn incense first. I like writing in coffee shops and restaurants, but not when they’re playing loud music or someone is looking over my shoulder. One thing that I absolutely cannot do is write when I’m angry. I find anger a fairly useless emotion when it comes to writing. Even when a scene that I’m writing demands righteous indignation, I can’t be angry when I write it. And unlike some writers, I can’t write when I’m drunk either. I imagine it would be a lot more fun if I could write when I’m both drunk and angry. MB: Do you have a writing schedule or goals in terms of words written or time spent writing? A page a day, however many hours that takes. But if it doesn’t happen, I don’t force it. One thing I’ve learned about writing is that it is a long, arduous process, and you need to forgive yourself a lot if things don’t go your way. You can’t always keep the momentum going, and there are days when your writing just, well, stinks. MB: I read in another interview you did that the first novel you wrote received a particularly blunt (and rather nasty, I thought) rejection from an agent. Luckily for readers, you persevered and kept writing. Do you have any words of wisdom for those of us still on the road to publication? Ah, you must be talking about that one agent who said that my characters were “silly, shallow, and superficial” and that she couldn’t imagine anybody on earth wanting to read my book. Harsh words, indeed, but I took whatever lesson I could from it. It was devastating at the time, because I was young, and it was the first novel I’d ever written and sent out to agents, but she meant well (I think), and I thanked her for taking the time to reply. Did I query her for my next book? Absolutely not. But did she make me a better writer in some way? I think so. One thing I do believe in is that in order to write and finish a book, a certain delusion or chutzpah or whatever you want to call it, is necessary. In order to keep going, I think it’s vital to tell yourself from time to time that out of the billions of people in this world, only you and you alone can tell this story. Because if there’s another person out there who can write it, then why bother? Let them do it. For better or worse, I think every writer needs to get to that place where they can shut out the world and create stories on their own terms. MB: Anything additional you might want to add (what you’re working on, when the next book is coming out, etc)? I’m working on the next book, which, as you can probably guess, is going at an excruciating pace. All I want to say about it now is that just like OF BEES AND MIST, it will also take readers to a place they have never encountered before, and introduce them to characters that are, hopefully, unforgettable. A huge thanks to Erick for taking the time to answer my interview questions! This interview is a part of a TLC blog tour for OF BEES AND MIST – click through to read the rest of the links in the tour! Erick has a lovely website too; and if you’re on Facebook, he’s also got a Facebook page (I’m a fan!). This entry was posted in Blogging and Blog Events, Writing and tagged author interviews, blog tours, Erick Setiawan, writing process on October 13, 2010 by Belle Wong. What an interesting interview – especially for someone who has not sold that first novel yet. And Eric, it certainly looks as if you have found your words! Great interview! Thank you for sharing. Thanks for the interview, I always enjoy reading about the behind the scenes life of other writers. And kudos to Erick for persisting in the face of that agent rejection! Determination definitely works. .-= Joanne´s last blog ..Own It- Part Two =-. I love the book title. That alone would draw me to pick it up. Rejections hurt, some more than others. But I do think most agents don’t mean to be mean. Somewhere in their heads, they think they’re helping. It helps if we as writers take it that way, as you did. It is a great interview! I love learning about the processes and habits of other writers. .-= Clarissa Draper´s last blog ..Teach a child to fish and some great blogs! =-. Great interview – thank you for posting! I loved this glimpse at Erick’s writing life. Thanks for the great interview! .-= Janel´s last blog ..Mundane Tasks =-. Great interview! Thanks so much for sharing this with us! I love the sound of this, and just downloaded the Kindle sample chapter to my reader. I can’t wait to start it! .-= India Drummond´s last blog ..Faery Blood Book Cover =-. Thank you everyone for all your comments. I truly enjoyed doing the interview with Belle. Helen Ginger — you are absolutely right. I think most agents mean to be helpful, and that’s why I didn’t shoot an angry, abusive email back at her (though I was tempted!). The most important thing is to believe in yourself and in your work, and keep going. Thanks for featuring Erick as a part of the book tour! I’m really looking forward to reading this one myself.